"The Heebie Jeebies" / "The Search for Captain Tim"
"The Search for Captain Tim"
Wander Over Yonder loves to do two things: experiment, with episodes like “The Void” or “The Breakfast,” and play with genre conventions, with episodes like “The Cartoon” and “The Hero.” Generally, Wander knocks it out of the park when playing around with styles and meta-styles, allowing the writers and animators to have ridiculous fun with the characters and the settings. Sometimes, though, those same writers struggle with messing with those various conventions, particularly when dealing with a specific genre. The most recent example was “The Bad Neighbors,” a fine if flat take on the generic sitcom. Well, we can add “The Search for Captain Tim” and “The Heebie Jeebies” to the “nice try” list. Not to say these were bad episodes. They were just lacking the kind of energy that usually allows the crew to really rip apart the genres that they were aiming for. Even if they weren’t looking to satirize genre conventions, opting to play them straight-forward instead, the episodes still lacked the kind of commitment, narrative and visually, for the audience to buy them. I mean, we were kind of already off to a bad start at the beginning of “The Search for Captain Tim.” I’m not sure how many of you remember who Captain Tim is. He is the monstrously violent pet that Hater “adopted” in “The Pet” (which handled its horror film tropes better than “The Heebie Jeebies,” but I’ll get into that in a bit). The episode tries to comically expound on how much the arachnomorph means to Hater, using a montage that showcase the creature’s attacks as moments of affection for Hater, consoling him after every defeat. It’s certainly cute, but considering that we’ve hardly seen Captain Tim in the past, it’s hard to get invested in the conflict when he goes missing. That leads to the episode’s most fatal flaw: holy hell, Hater’s constant whining over his missing pet is really annoying. 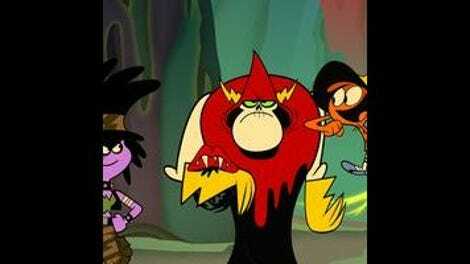 I have a high tolerance for annoying moments in cartoons (I’ve voiced my relatively high opinion of Teen Titans Go! in the past), but Hater comes across nigh insufferable here. I think it’s because there’s no comic foil (Wander) or solid straight-man (Peepers) to ground Hater. He pretty much sobs from minute three until the near end, and, god bless her, Ripoff doesn’t blunt enough of his energy. I love Ripoff, too: besides her awesome character design, her clear parody nature of every “badass with a dark history with monsters” managed to stay on the right side of enjoyable. But for the most part, she and Hater never quite “connect,” either as rivals or partners (or that comically weird in-between) because they seem to be operating separate from each other. The only nifty moment occurs when the two trade past injuries, but the motivation for the scene is a bit hollow for it to work at a narrative level, and too direct to work as a parody of similar scenes in similar shows/films. “The Search for Captain Tim” takes the two to the arachnomorph’s homeworld, they spar over whether to shoot Captain Tim (allowing the only brief moment of Hater’s fully-powered self), then get trapped in Queen’s web. The beats then follow what you’d expect: comic appearances by Wander, Sylvia, and Tim (the WatchDog) fail, Captain Tim shows up and looks as if he’s sided with the Queen, then, lo, he doesn’t and saves everyone. It’s weirdly perfunctory, with the distinct lack of winking comedy to work as a satire of the genre’s conventions, and the distinct lack of narrative or dramatic beats to work as a character-driven narrative. The lack of real rapport between Ripoff and Hater only knocks it down a bit more. 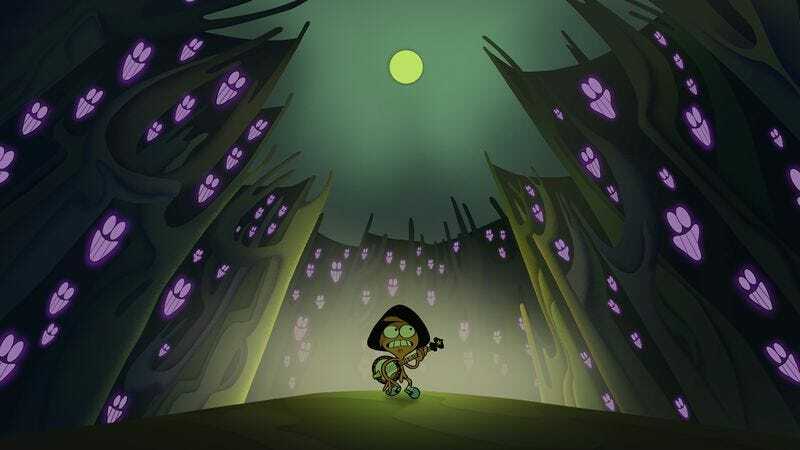 “The Heebie Jeebies” is somewhat stronger, if only because it continues to emphasize the strong, emotional bond that’s been established between Wander and Sylvia. It’s the hidden theme behind the episode ghostly plot, but it comes off undercooked because it unfortunately relies on a weak cliche: Wander is scared of a real thing but Sylvia doesn’t believe him. It’s not so much that the premise is a problem. It’s that it relies on it for most of the episode. I spent quite a while waiting for the episode to kick things in a new direction, or at least push past this trope, but it never did. Of course, the episode utilizes some great visuals: the creepy, dancing ghosts were perfect, as was the use of blacks and yellows, and distinct framing, to create claustrophobic, isolated feelings. Yet the episode never really tries to create a genuine feeling of dread or horror. (I hate these kinds of comparisons, but look at The Amazing World of Gumball’s “The Joy,” “The Nobody,” or even “The Comic” for those shocking bursts of “holy crap” moments). The overall approach is to be more jokey towards the genre convention. Yet like “The Search for Captain Tim,” “The Heebie Jeebies” never fully commits to the parody nor the sense of true terror, fitting some arbitrary in-between. There’s some cute, smarmy gags that suggest parody: the “Wilhelm Warbler,” that’s apparently everywhere, and Wander’s repetitive dreams-with-dream sequences, which never quite acknowledges how silly it is. And indeed, there’s the elements that suggests genuine drama: Wander’s facial expressions of fear are funny but organic, and when Sylvia loses sight of Wander, her own fear (manifested when she finally sees the dancing ghosts) is palpable. What holds that aspect back dramatically is that–besides the fact that nothing actually will happen to Sylvia/Wander–is that it’s not at all clear what will happen if that fear consumes Sylvia and Wander. Like Hater and Ripoff, Sylvia and Wander are operating from two different places. Wander’s fear is broad and driven by comic reactions; Sylvia’s fear is personal and disconcerting. The combined effect dilutes both the parody and the drama, resulting in an episode–well, two episodes–that never gets a handle on what it wants to do. I was watching this via screeners, so I’m not sure how “Ripoff” was supposed to be spelled since I didn’t have captions. Correct me if I’m wrong, but the events at the end of “The Search for Captain Tim” were the ones briefly seen in “The Waste of Time,” right? I’m surprised that wasn’t even partially referenced. Wander and Sylvia come to arrive based on Hater’s “Missing Pet” listing, not because they foresaw the events. This contributes to the episode’s inability to play it comical or straight: instead of winking at the reference, or playing it within the conflict, it just ignores it. A Ripoff/Sylvia pairing is something we’ll never get to see, unfortunately. It would totally work.